In a club that exist nearly half of a century, where more than thousands of registred players went through the First team in each level of competition –it is necessary to have a lot of principles, high criterias, datas, memories and analysis to come to a possible choice of two best players from the foundation and ones players from the earlier period of the club. As in every election, this one will also be a subject to criticism and updated in the run –but this time we payed attention to the player’s qualities, his playing lenght, and the importance of his contribution to the club. According to all crtiterias Dusko Ajder is the best and the most successful player of FK RAD from its foundation. He actively played and was capitan of the team from 1978 to1990. Dusko is the first big star of the club. First of all because of its incomperable contribution as a player, then because of its positive influence on the team as its capitain and its whole attitude toward the club as the player with the most influence in the periode of the entire twelve seasons in the association rank of the competition . . .
DRAGAN KOKOTOVIĆ Dragan Kokotovic –Koka has made his first and last footballistic steps in Yougoslavia only in FK RAD: he spent his active football player’s century in the club, he started and went through the whole FK RAD youth categories and ended as the indispensable first team player and capitain, he played as a professional in Greece. 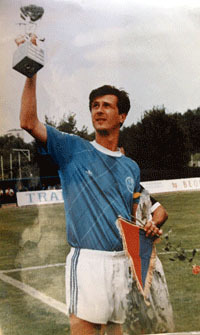 From the talented dark haired kid who had to play everytihing that they asked him to in the youth categories, he grew up to an exceptional professional player, all round player of an extra class, the second big star of the club . .
MIODRAG VRANJEŠHe came in the club in the year 1979 and since then he was regular, irreplaceable fist team player. It happen rarely that a defensive player leave a deep mark in the club’s history: he played around 500 games in the Championship and Cup competition (ATMOST IN THE CLUB HISTORY) in the association leagues he was uncompromising, aggressive left fullback who never spared himself or the others, a very strong part of the defense . . .
RATOMIR JANKOVIĆ In the First league of Belgrade, in which played todays first division’s clubs Zeleznik, Obilic and Hajduk, as other old and esteemed clubs from Belgrade and Zemun ( BASK, Bezanija, Graficar,…), was played a good football, and games were more watched than todays first division ones. The best player and capitain of the team in the periode between 1965 and 1970 was Ratomir Jankovic- the Duck . . .
LAZAR SLAVKOVIĆ The competition in the third, second and first rank of the Belgrade’s sub-association took place with teams from suburbs and villages, on rough, unprotected fields but with a passionate public who couldn’t wait a week to support and eventually hit referees or opponents. FK RAD fulfilled all the sportive, material and the other conditions for the Serbian league but only by the mistake of the Founder the club lost itself in this competition . . .
SRETEN ANTIĆ – SELEHe came in FK RAD in 1962 as a player who playedfor the First division club BSK (today’s OFK Belgrade) at the ending of his carreer and he played for the club two great seasons thanks to his knowledge and experience. He was back in the club the 1967/1968 season and took over the place of the chief coach with the assignment from the Founder to enter the Serbian league from the Belgrade league as soon as possible. . .
Mr DJURDJE ŽIVKOVIĆHe was born in Banjica in 1938. He entered FK Rad and the company in 1958 and stayed there for 48 years. In a wider cercle, he has the statut as a Founder of the club. He graduated got his master while he was working in GP RAD, where he stayed his the rest of his carreer. . .